Such wonderful memories I have with Nancy. Me and my friend Lisa would create out own mysteries following in Nancy’s footsteps all the way. I had them all on a shelf. I wonder what happened to them! I wonder what happened to my Nancy Drew collection too. I don’t remember getting rid of them. Maybe I did when I moved out of my parents home. I’m rather sad about that. Same here, I don’t recall donating them. I hope another adventurous little girl is reading them. I hope so too! You know what else makes me rather sad? We have three daughters (now adults) and they never got into Nancy Drew books. Or the Little House on the Prairie series either. I tried, oh, I tried. I feel your pain. I had three boys who never knew the joy of the Hardy Boys, though they didn’t mind a bit of Enid Blyton. Did you have those in the U.S? Yes, and my girls devoured them. I clicked on your gravatar but it says the author took down the site. Is that true or am I doing something wrong? OH! That’s not good, I’ll take a look at it. I think I might have fixed it 🙂 Fingers crossed. Until then, here it is. Sarah . . . I just read comments on my Father’s Day post from 2012 for kicks (it is getting a lot of hits today). You commented! We have been friends for longer than I knew, you introvert, you. 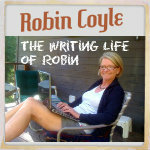 I haven’t been around in ages, Robin, I was so busy with family and moving and life but it’s wonderful to blog again. I always enjoyed it. I read you’re looking after your mum, I hope your taking time for you as well. Sadly, my mom passed away in December of last year, just 6 weeks after my dad died. That, and may other things kept me away from blogging for about a year. I am enjoying being back as well. That is an excellent compliment! That must have made your day. I too credit Nancy for giving me the love of reading. The books were like candy to me. I think it is cool that in the day of tough-guy detectives like Same Spade and Nick Charles, Nancy was out there solving mysteries! The only thing I can recall from the Nancy Drew series is when Jo (I think that was her name) swung a bat to crack some bad guy’s knees. Very impressive. I suppose video games are OK if they get girls interested in STEM things, but I’m wondering if that’s the PR spin they put on this rip-off of an existing successful, but booky, brand. Do I sound like a curmudgeon? No, you don’t sound like a curmudgeon (one of my favorite words). My first thought when I learned that there is a Nancy Drew video game was, “Those girls ought to be reading a Nancy Drew book instead of playing a dumb video game! Who is the curmudgeon now!? Huh. That’s all I can think of to say. Loved Nancy Drew as a girl, but have lost touch with her over the years. Seems like this month might be the right time to check in with her and her fan club and her video game and her new mystery. Who knew? Exactly. Who knew? It is nice that the old girl is still around. A Nancy Drew game. That’s great. Never was a fan of the books. Read some of the Hardy Boys as my brother already had those in the house. Both series seemed to be too easy to figure out back then…and if they have “dumbed them down” like other books. Maybe a new set of determined clever witty ghost writers can step in. Kids like carryovers and links between games and books. Great idea! I was bummed that my girls never got into the Nancy Drew books. They thought the stories were too predictable. I can’t imagine how a Nancy Drew video game would work. I’d like to play it to see if I am a crime-solver like good old Nancy-the-crime-fighter-in-a-skirt. Doubtful. I am too naive and don’t think anyone could be capable of a crime! Wow, 85? I had no idea! I loved those books when I was growing up, and it’s great to see there’s still an audience for them. Yes, it is nice that in the day of Twerking, the Kardashians, and raunchy rap music, innocent mystery novels with a good storyline still have a place in young girls hearts. Tell me about it. And I bet I have 20 or more years on you, you youngster. I was actually confused when I read the title of this post… how could Nancy Drew be 85? Does that mean Carolyn Keene is ancient? I had absolutely no idea it’s a pseudonym for many authors! It all makes sense now, haha. Can you imagine the pressure of being a ghost writer (or whatever) for Carolyn Keene? Big shoes to fill with lots of little girls hanging on your every word. I don’t think I ever read the books but I remember loving the TV show as a kid – Nancy Drew and the Hardy Boys alternating each week I think, didn’t they? I can’t remember a whole lot about it other than really liking it! I had no idea there was a computer game though. Some of the things that come out of TV shows always surprise me. In the UK a few years ago they had a one-off TV show about the 100 greatest musicals of all time, I think it was as voted by the British public, all the usual suspects you would expect were in there, especially as we got closer to number 1, but then right high up at number 13, there was the Buffy the Vampire Slayer musical – what?! Shocking enough that a musical had been made of it, but for it to be at number 13 in the hundred greatest of all time! Well, that is just wrong-o! Last weekend I went to a production of selections of Broadway musical numbers by the chorale society. Buffy the Vampire Slayer was NOT one of the numbers. But it was almost 2 hours of wonderful music. I had tears of joy the whole time. I am such a sap. Ha! That is good material for a different kind of book series! Maybe my “50 Shades of Grey” crack isn’t so far from wrong. Nancy holds up well. The Hardy Boys, on the other hand are only concerned with The Mystery of Why Can’t Those Damn Kids Keep Offa My Lawn? You mean the Hardy Boys are now the Hardy Grouchy Old Men? Perhaps their new series of mystery books will be a hit with the cane and walker set. Ha! Those guys need a shot of Geritol and a whiskey chaser. That would be a helluva HB reboot, wouldn’t it? But then they would start reminiscing about the good ‘ol days when they chased skirts and tried to get Nancy Drew in the backseat of their Edsel. I read the Nancy Drew Files (an updated version of the series) and loved them, and like you, read them voraciously. While the only video game I play is ATV:Off Road Fury, I love how there is a game for girls that inspires them to get into math and science, the fields still geared for boys (although much has been done to remedy that). I may pick up a Nancy Drew book (I have the very first one I read) and see if it holds up today. I bet it will seem quaintly corny . . . and sweet somehow. Do you know that aside from Pong, Pac Mac, and maybe Astroids, I have not played a video game. I guess I am in the dark ages still. I don’t think you can do better than Pac Man. That is just the perfect game. I would like to go back and reread some of my childhood favorites to see how they hold up. One of them was a story about a family who moved out West in a covered wagon, but it wasn’t by Laura Ingalls Wilder. I checked that out from the library numerous times. I wish I remembered what it was called. I bet with a little research you could find that book. I was a Laura Ingalls Wilder fan too. I was so disappointed when my girls couldn’t get into the series. I never read Nancy Drew but I am for anything that encourages getting involved in science, technology, engineering, and math. Go Nancy Drew! 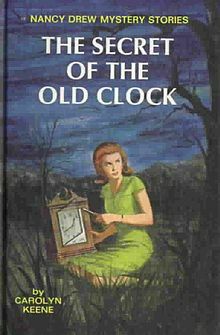 It is nice that young girls are looking at Nancy Drew as a role model and not some stuffy, dumb person with mystery stories their moms used to read. Until I saw the story in the paper, I had no ideal the old girl was so . . . well, old. I am delighted she is still hanging with the cool kids. Yes, I have seen many, many new editions and that warms my heart because the kids must be reading them. I love your damn wit..made me laugh out loud…10 percent. Video games have come along way. Even the fighting games now have strong warrior women characters as well as the “lighter” role playing games. My gals are very happy with this change. I was never a Nancy Drew fan but I sure can respect the old gal. She has aged quite well. And what is with the clock in the field? I bet Nancy wears an Apple watch these days. Nancy was the first in line to get the new Apple Watch. She slept outside the store overnight to be fitted. She says it helps her in her crime-fighting. I LOVE it when I make you laugh out loud! It is my goal with every post. Think of how far video games since the days of Pong. And we thought Pong was so cutting edge! There is a bar in Boise called “Space Bar” and it is filled with retro video games, skee ball, pinball machines. Oh, and nerds. It is like walking back in time. We have a Pac-Man arcade machine. On it is Donkey Kong and Galaga, too. It’s fun to go back in time and play it. Oh yeah, Donkey Kong. How could I forget that one?